The Trio of falls above is sometimes referred to as Rocky Fork Falls -- which makes sense to me as this is the most unique waterfall found in Rocky Fork (the series of falls on Lower Higgins Creek which are at the northern edge of the enormous 10,000 acre parcel of land known as Rocky Fork are also spectacular). Some books and websites list a nearby 10' waterfall as Rocky Fork Falls. It can be seen from the car on Rocky Fork Road. 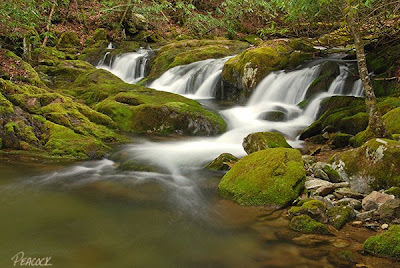 Click here to see the many cascades found along Rocky Fork. Directions: Take the Flag Pond exit off of I-26 (exit #50), at the stop sign turn left onto Higgins Creek Road. Drive ½ mile, til you reach Rt. 23, turn right and travel 2 ¼ mi. through Flag Pond, then turn left on Rocky Fork Road. Take your time driving up this road, the creek offers amazing cascades and waterfalls. After ¾ mi. you will see a gravel pull-off to the left with space for about three cars. Park here (out of the way of the gate) and follow the gravel lane into Rocky Fork on foot. The trio of falls seen above is about a quarter mile in on your left. Click here for a map of the Flag Pond area. 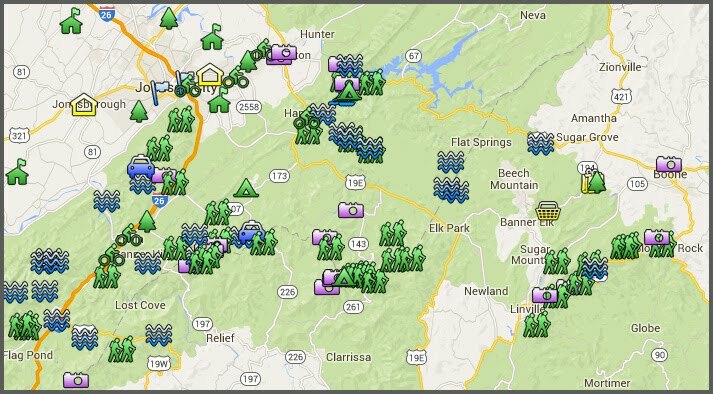 There's an excellent new map of Rocky Fork -- (after clicking link, click 'download now') -- which shows the way (about 4-5 miles) to Buzzard Rock and its awesome views.